Earth Day is April 22nd. When I was in college and on my big hippie kick, I loved Earth Day. I was part of the Earth Club in college and we always put on a huge Earth Day celebration, sometimes lasting all week. Here are some of my favorite activities to do that don’t cost a dime! Not only are these free, they are fun for all ages, from preschoolers to adults. 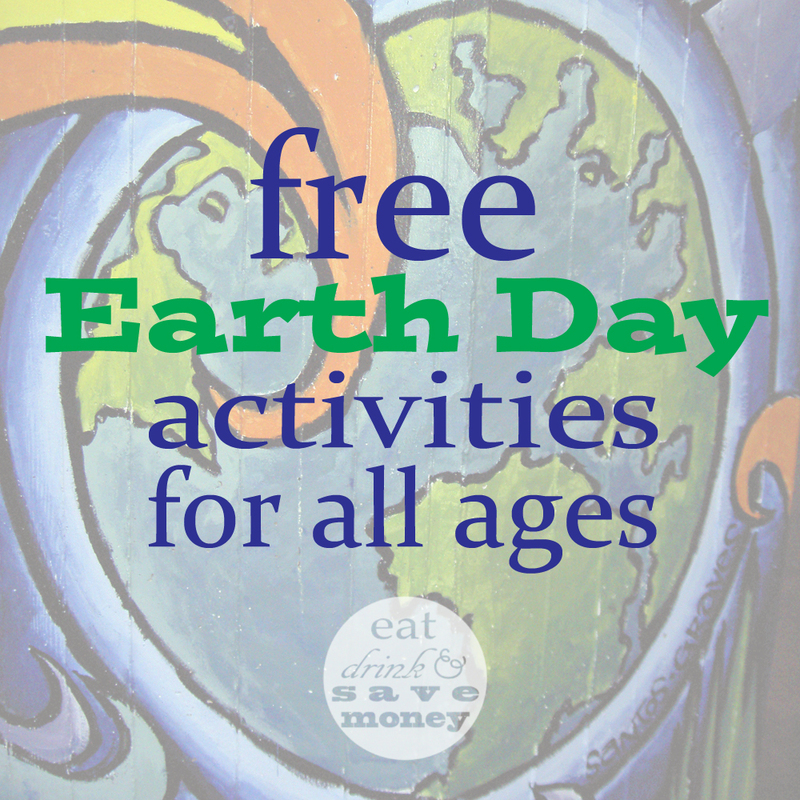 I hope you and your family enjoy these free Earth Day activities for all ages as much as I do. This is my favorite one, which is why I put it first. Calculating your environmental or ecological footprint is a fun way to make yourself aware off all the ways you could be more environmentally friendly. After all, Earth Day is all about awareness. I like to use Earth Day as a way to self reflect and see how I could improve. Global Footprint Network is my favorite way to calculate my environmental footprint. I find it entertaining for middle school kids and up. Here is my footprint, and I think I live pretty sustainable compared to most people. It’s eye-opening to realize that if everyone lived like me we would need 4 Earths to sustain us! Here is another one called Eco Footprint Calculator that is a little easier for elementary aged kids and still equally as fun for me! Growing new plants from food waste is always fun for me. I used to do this all the time before Robert was born. I can’t wait until he is old enough to do this with me. Check out this list of 25 foods you can re-grow from scraps. Find some scraps in your fridge and start growing something on Earth Day. This is a tricky one and can easily turn into a science project. Got kids who need to do a science fair project? This could be a fun start! Many genetically modified fruits and vegetables can not always be used. Part of the point of most genetically modified organisms is that you have to pay a big company for their seeds. It would defeat the point if the seeds could reproduce on their own. This isn’t the case for all genetically modified plants which is why I think this is a fun science experiment. Save seeds from an organic fruit or vegetable while also saving seeds from the same fruit or vegetable that is not organic. Google the proper way to germinate the seed and see which one will grow. Maybe both will! Don’t feel like you have to buy specific fruits or vegetables for this one. Just save the seeds of your tomatoes, squash, melons, garlic, apples, beans, grains and even some spices! Keep in mind that these seeds may not turn into a real garden, but it is still fun to watch something grow from your waste. For more information, check out Mother Nature Network. I’d also recommend a specific Google search for your particular seed instead of a general search of “plant seeds from produce”. You’ll get better results! I don’t think I need to explain myself here! Earth Day is the perfect day to plan an outdoor adventure. Go on a bike ride, a hike, or head to the park. Do anything that gets you outside and appreciating the Earth. Don’t know what an ort report is? You’re missing out! Merriam Webster dictionary defines ort as “a morsel left at a meal”. Even Urban Dictionary knows about ort reports. I was first introduced to ort as a camp counselor at Camp Beckwith in Fairhope, AL. After every meal we would have the kids dump their uneaten food from their plates into a bucket that we would weigh. We charted the results and challenged the kids to have less waste throughout the week. An ort report is a fun way to reduce food waste, especially for kids. I like it because it offers a visual of wasted food. This can be done at home too, even if you don’t have a family of kids. Take notice of the food that is left on your plate and challenge yourself to be part of “the clean plate club”. You may wonder why this is important. Once food is on your plate, it isn’t exactly sanitary to box it up as leftovers. It is much better to box up leftovers that stayed in the serving dish. Of course, when it is just the three of us at home I always box up leftovers from our plates. However, this isn’t allowed everywhere. Just think of food at a buffet. If you put it on your plate and don’t eat it, that food is now wasted. Had you left it where it was it could have been packaged up for a homeless shelter or even helped the staff realize that they have less demand than supply, allowing them to order less next time. It’s all part of a chain. Food takes a lot of energy to make and it is a shame to waste it. Challenge yourself or your family to use less energy during the day. Turn off the lights as you leave a room and have fun eating a meal over candlelight. Ready for a messy hair day? Use less energy by unplugging the hair dryer for a day. Or forever if you happen to be me. But that is another story. If you don’t use a hair dryer, try unplugging something else for the day. Maybe you could unplug your phone charger, your coffee pot. Anything just to see if you can do it. Unplugging your devices when they are not in use saves you money on your energy bill! For one day, time your shower to one song. Bring some music into the bathroom with you and limit yourself to one song only. You may find that it isn’t as hard as you think! Turn off the water while brushing your teeth or scrubbing your face. These are easy ones that we all know already, but Earth Day is a great reminder.